This is a recipe I originally posted in my fitness blog several months ago, but since not many people have access to it, I thought I'd republish it here! As some of you may know, I've been on a real health kick of late. I've lost about 50 lb in about a year and a half (most of which I had gained during grad school), I've started running long distances (I'm doing a 10k race this Sunday! ), and in general I've been trying to improve my diet. Part of this has been to drastically increase the amount of protein I've been eating since I'm a real carb addict. I find that the easiest way to get enough protein in my diet (not that I really get enough protein) is to have a can of tuna once in a while. I have been known to eat it straight out of the can when I'm feeling particularly lazy, but let's face it: tuna on its own is pretty damn boring. For a while I was mixing it with low fat greek yogurt (instead of mayonnaise), a few nuts, maybe some herbs or cut up veggies. I haven't bought greek yogurt in a while, however, so today I decided to mix it up with some stuff I had lying around the kitchen. Thus were born these super tasty tuna patties. Mix everything in a bowl with a fork until it's well-blended. Heat up a frying pan to medium heat and add a small amount of fat for cooking (a couple of sprays of non-stick cooking spray in my case). 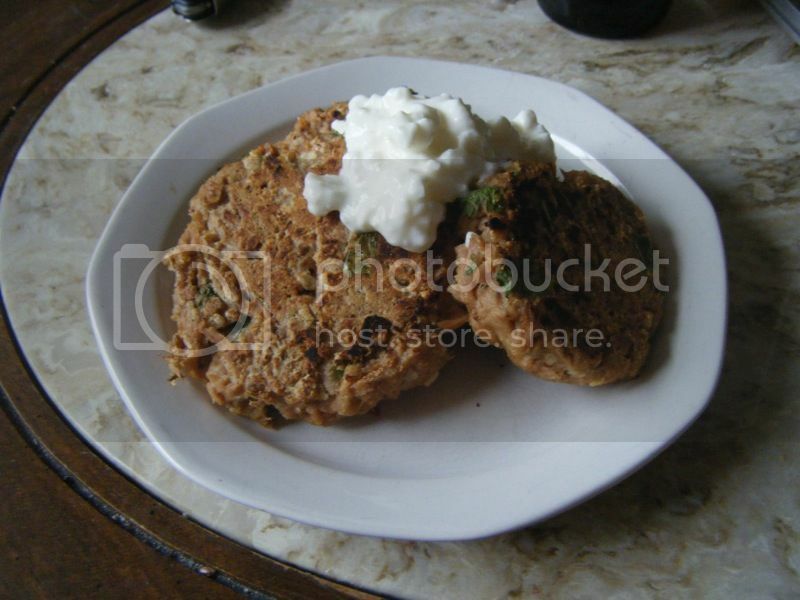 Form the tuna mixture into patties with your hands and gently place them in the frying pan. I was able to make three approximately 3-inch patties. Cook for 5 minutes on each side. Serve immediately.